Our approach to the store’s wine selection is simple, we handpick everything we possibly can. There is a sea of products out there, and we navigate through it looking for tasty value wines from smaller producers. Perceived value can be at any price point, so we categorize our wine selection into three distinct groups; Value Wines under $20, Good Examples of Region or Varietal between $20 and $50, and Wines of Stature $50+ (these are stashed in The Vault which staff can personally show you). So whether you want to spend $12 or $1200, we have a wine for you in the carefully curated groups / categories mentioned above. 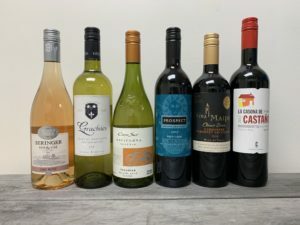 Here is our latest Wine Mail #5 offering, please browse the descriptions below and then head to the bottom of this post for ordering details. Prices are pre tax & deposit followed by the total. Enjoy! – Earthy, dusty plum aromas, medium weight with nice juicy acidity. Case of 6 bottles is a total of $86, or 12 bottles (2 of each selection) at a 10% discount for a total of $154.80, delivered to your door. Delivery is FREE in the Greater Victoria Area. To place an order, please call 250-995-2665, 10 am to 10 pm, 7 days a week. We don’t accept orders via email, phone only. PLEASE NOTE: We need at least 24 hours to schedule a delivery. There are NO deliveries on Sunday or Monday. DELIVERY SCHEDULE: Tuesday–Friday: 11am–4:30pm; Saturday: 2pm–5pm. *Disclaimer: Purchaser must be of legal drinking age and provide two pieces of ID upon delivery. This offer is subject to availability and delivery schedule (see above).